What do poetry, absinthe and a well-kept Paris Perfect secret have in common? This is all about a gift-shop with a difference. It is THE place to go to get your handmade gifts that have been made in France. 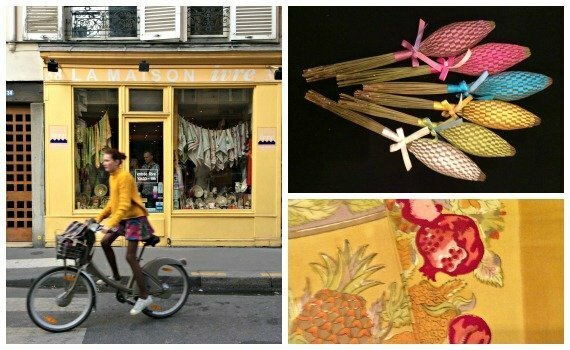 This unique shop is called Maison ivre and is situated in the Latin quarter, a stone’s throw away from the famous Café Flore and Saint-Germain-des-Prés. The name of this shop literally means “Drunken House.” While there is no alcohol or absinthe on the premises, you still may feel a little dizzy when looking at all the colorful objects. Whose idea was this anyway ? I’d like you to meet Sylvine. She opened la Maison Ivre in 1991. Her goal was to bring together wonderful creations by craftsmen and craftswomen from all over France. And she has had a grand success! What’s behind the name Maison ivre ? Sylvine dreamt about becoming a poet but even after her studies in French literature, she soon realized how difficult it would be to make a living out of her poems. So as a homage to Arthur Rimbaud and his poem “Le bateau ivre,” Sylvine decided to create her “Drunken house.” She wants her house to be a real yet rather poetic experience for visitors. She hopes that each person who enters her shop will appreciate how different it is and also the products on display. Who are the typical Maison ivre shoppers ? They are mainly anglophones who are both Francophiles and are enthusiastic about French country style products. They are also people who value l’art de vivre, elegance and tradition. You can find ceramics, traditional quality textile goods and products made using lavender. These goods come from all over France including Alsace, Provence, Savoie, Pays Bas and les Vosges. Each object has its own particularity, handcrafted and authentic. What are the bestsellers ? Sylvine says visitors love the teatowels so much that they keep coming back for more. The linen place-mats in vibrant colours are also very successful. Apart from traditional textiles, the ceramic objects, mugs and decorative objects provoke much interest too. Last but not least, the selection of lavender gifts are particularly traditional and are very practical to take back home for friends and family. They will be delighted with these handmade gifts. Who could refuse a gift which has been made in France: a lavender bag with your own or friend’s initial, a tea-towel with the famous macarons or a sunny Provencal tablecloth which makes you dream of sunshine and olives? They will adore the wonderful images of the Eiffel Tower and other symbols of Paris and France. A favorite at Maison ivre ? Returning to the owner, Sylvine, what is her favourite among all the treats in la Maison ivre ? “I love the ceramic animals like the donkey or even the pig. They make me laugh and I want people who come here to have fun looking at these fascinating objects which have been made with care and imagination.” The writer of this blog urges you to check out the “quenouilles de lavande” or unique lavender shakers. These are a dying art and made with the long sticks of lavender and folded in a unique way so as all the flowers are contained in the bulb-like part. They branches are kept together using beautifully colored ribbon. Go along and give Sylvine a visit. She speaks English and loves meeting people. Her Maison Ivre is situated at 38 rue Jacob just off rue Bonaparte as you walk from Saint-Germain-des-Prés to the Seine. It is open Monday to Saturday from 10.30am- 7pm. You won’t regret it! Go and have a look and think of Rimbaud’s journey on his “drunken boat” and imagine poetic journeys. Experience something completely different while shopping in the Latin quarter!